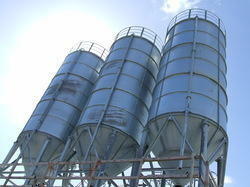 The cement silo is usually used with the concrete batching plant to store bulk cement. It is the main part of concrete mixing plant. Except for cement, it can also store bulk material, like fly ash, fine ore, dry mortar, etc… It is featured by rain and dampness resistant, and easy to use, etc. Our Bolted Cement Silo For Export Market, detachable cement silos which are manufactured in different capacities, provide great advantages, especially in transportation. 1. With different capacities:30T, 50T,100T,150T,200T,etc. 2. Customized sizing and layout to specific requirement Sub-structure, easy transportation, installation fast, level display, with the positive and negative regulator, costs, Green filter. 3. Put in bulk powder (cement or fly ash), waterproof and moisture, easy to use and costs, the top of cement silo with green filter, used to reduce dust leakage. Looking for Storage Silo ?